First Look | J. Crew Spring Mens 2009 | A Continuous Lean. Nice Mister Freedom tee shirt. Nice, but not any different than the last 5 seasons….Would be nice if any of the ideas seemed new….Same old….Good Luck J Crew..! Did you land J. Crew as a client? Not that I mind the reporting on your clients — the more I can hear about Alexander Olch’s ties, the better. Nope â€” I will always point out when I write about clients (which is few and far between). I just like what they are doing over there at The Crew. It seems like at least a few of the items – black watch plaid coat, the hightop sperry’s – are right out of the Band of Outsiders playbook, but a year late. That Black Watch plaid jacket is actually from Mackintosh, the ORIGINAL. So, this would mean J. 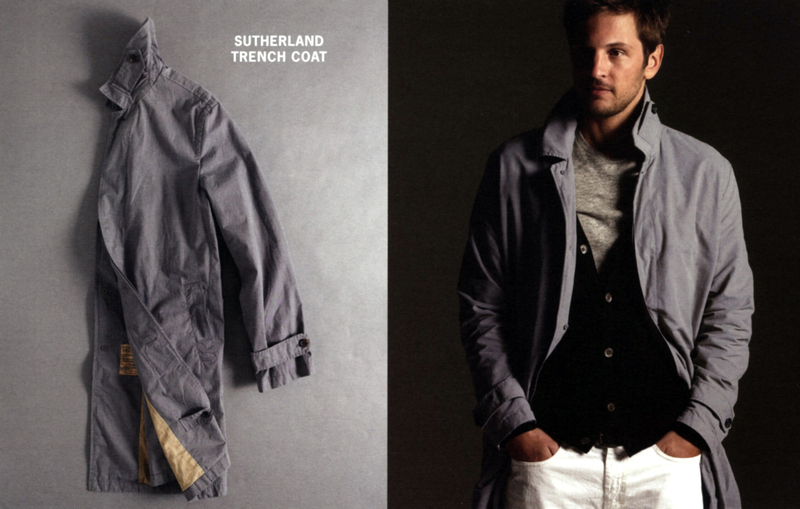 Crew is biting Band (which is a brand I love), who is biting Mackintosh (who I also love). Win win? I say yes! While I like the look, the sweatshirt look and the t shirt sunglass look is very Ralph Lauren – but again last year. 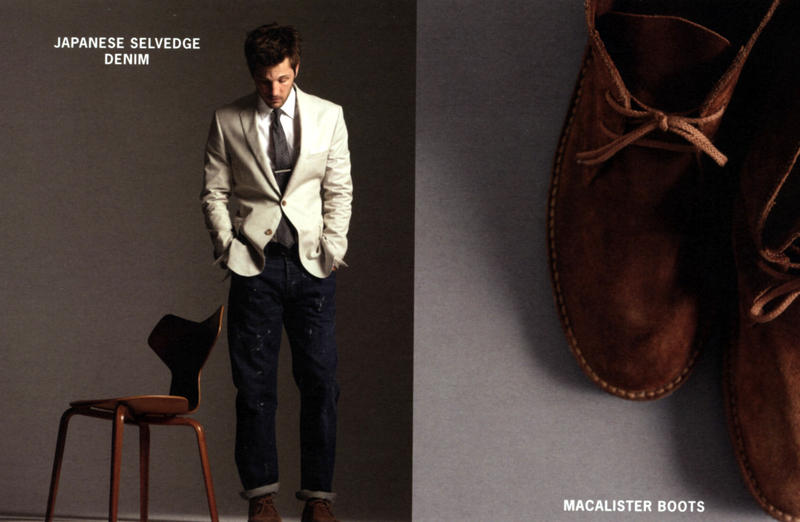 The Black Watch Mac is in the j.Crew men’s shop right now. It was one of the items that jumped at me when I was in there the other day. Pretty sweet. 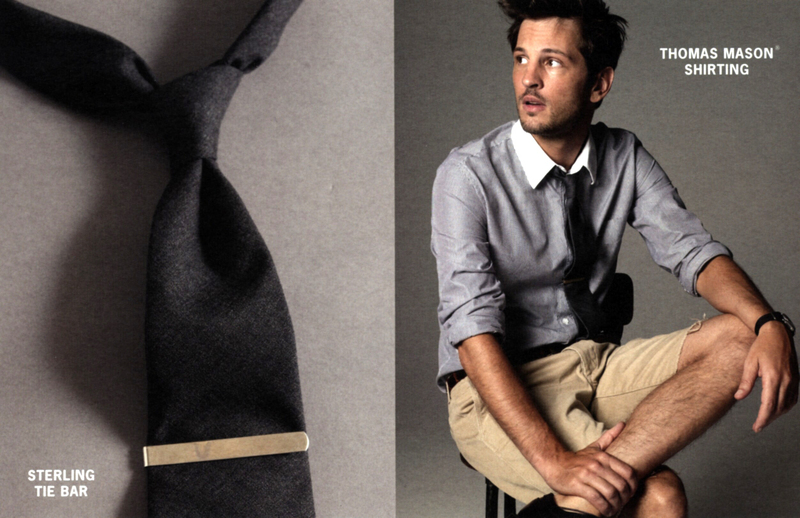 Men’s style…so last year…and the year before…and the year before that…WHAT DO YOU EXPECT, PEOPLE???? What’s the story behind the Mister Freedom items, and will there be other things besides shirts? Is Christophe making them for J.Crew or is it more of a collaboration type deal (with J.Crew producing them)? walking around so I’m happy to see that coming through in the face of the brand. I think I’ve bought more JCrew items this fall than any other brand. Hats off to the Crew for being up on their game. Those OD Work Shorts are the business! The Ludlow suit kind of looks like a knock-off of Thom Browne. I have some J.Crew things I love, prticularly a pair of perfect khakis. But I’m always somehow disappointed when I go to the store. I walk in feeling like I want to like it, but then the socks are $16.50 and a solid color cotton knit tie is $60, and it’s all cool but kind of typical, and I wind up leaving empty handed and feeling yucky for going to a chain store in a mall that sells cheap sweatshop stuff. I don’t know, it’s kind of just a glorified overpriced Gap. Agree with all the above, their catalogs look nice (if a bit condescending “world famous moon mill”, world famous shirtmaker ___” etc), but the clothes are disappointing. With a bit of effort one could find a better (or original) version of many of their items sans cheesy distressing, often for cheaper. Still, I like thumbing through their catalogs, even though they haven’t really progressed much in the past couple years. And I’ll buy some things (always on sale) socks, scarfs, the occasional shirt. Is the sweatshirt look really a year old? I kinda thought I was cool and cutting edge, sigh. I commend you for showcasing traditional American-made brands, a lot which don’t have anywhere near the needed capital to compete with corporate brands. J.Crew is one of these brands I would think. Their designs are presented in an appealing and glossy manner, but aren’t original or exciting. The nicest things that they sell are all things that they didn’t make themselves. Appropriating a distinctly American image, counterfeiting it in China or wherever and then selling back here to the detriment of US manufacturing seems immoral to me. Perhaps I’m getting carried away, and forgive me if I am, but the idea of following the Red Wing post (with the American factory tour comment et al.) with one about a company that got sued for using sweatshop labor instead of American workers, is anathema to me. Honestly, ACL’s sole mission isn’t only to talk about things made in America. I like to highlight that sort of stuff, and I try to support American manufacturing whenever possible, but at the end of the day I wear clothes from J Crew and lots of other brands all mixed together. The high with the low. This website is about clothes and style, not labor policies. Comparing The Gap to J Crew is like comparing J Crew to Engineered Garments. It is all in the fabric and details. But I wear clothes from all three brands, sometimes at the same time. I like Gap t-shirts, J Crew waffled henleys and EG’s shirts and field jackets. I think before you characterize a company as immoral, you should have substantial facts on your side. We live in an increasingly global world and I’m glad to see more of the world’s people participate. might i add to the conversation, that j.crew clothing is more expensive than gap, but also better quality. within the past year i would say, they have been becoming more of a luxury brand. their leather bags come from the same tannery that does louis vuitton and hermes. i would also comment however, that i absolutely love their women’s things, but their mens have been lacking. i buy my boyfriend basics and shoes, but there hasn’t been anything within the past that i have just been absolutely dying for him to wear. i’m not quite sure how they would go about revamping mens, but they could push it a little more. Hey just cause Ralph has shown a similar look before, doesn’t give him complete authority of the trend. I’m a huge Ralph fan, but at the end of the day I struggle to find anything without the damn polo pony logo. J. Crew provides the cool factor without the billboard logo. Also, most guys really couldn’t tell if style was “last year” or not…we’re talking timeless classics here. Is it me or have the same things been coming out for a few years now? And where does a company like J. Crew get off charging so much for dress shirts, you can’t tell me that its because of the quality?